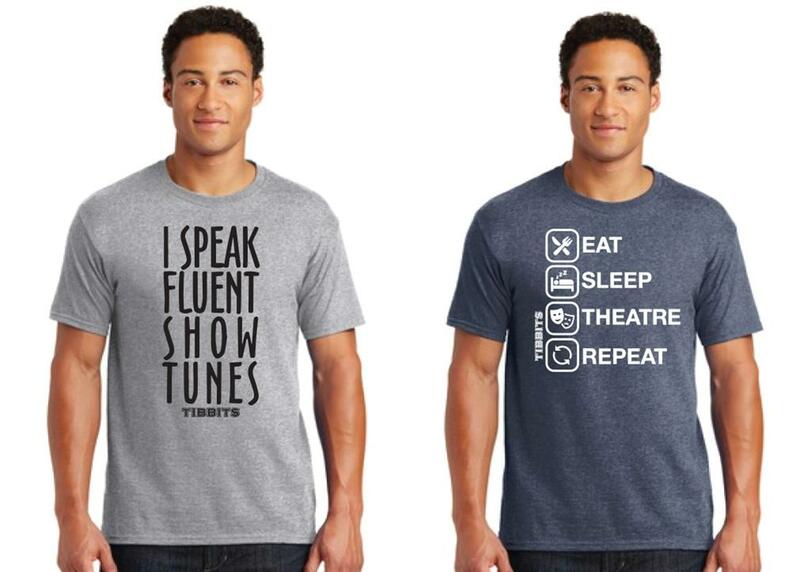 All of the following items may be purchased online (shipping charges apply); at the Tibbits Offices at 93 West Chicago Street, on the corner of Chicago and Clay in Coldwater, Monday through Friday, 9 A.M. to 5 P.M.; or in the theatre gift shop during TIBBITS events. Gift certificates are an excellent way to give the gift of fond memories, which every show creates. 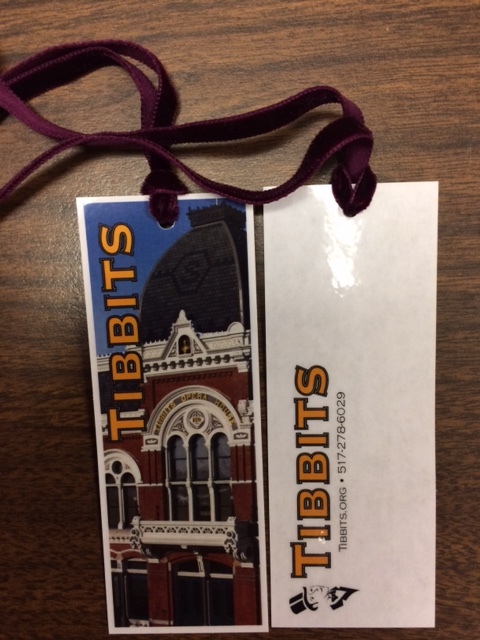 Great for all ages, gift certificates may be used to purchase show tickets to Tibbits Summer Theatre, Tibbits Young Audiences productions, Tibbits Entertainment Series, and Popcorn Theatre; Tibbits memberships; or treasures from the theatre gift shop. To purchase your gift certificate on line click the button below. You may choose from our most requested certificate values or call the box office at 517.278.6029 for additional denominations in any amount. Tibbits will process your order and ship to you. Use the comment section to provide a different ‘ship to’ address or add any messages. 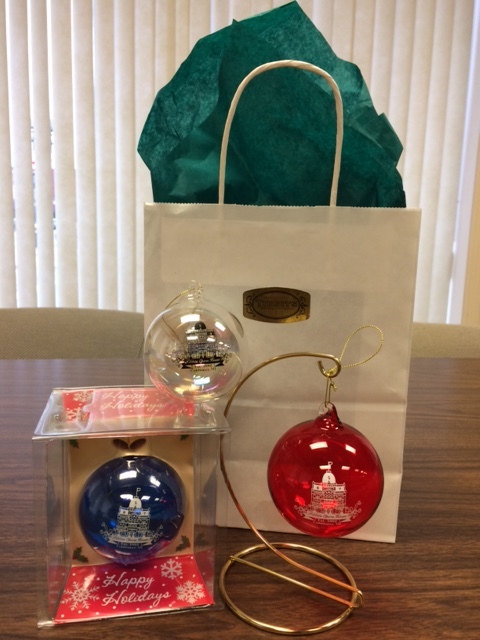 These hand-blown glass Tibbits ornaments are so pretty that you’ll want to leave them out as a decoration all year round! Ornaments are available in blue, red, or iridescent white and sold with or without a gold stand. They will be shipped via USPS. Savor your favorite drinks with help from this eye-catching 16 oz. 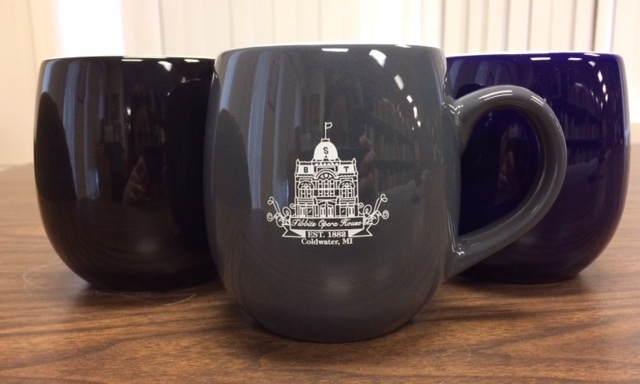 ceramic mug that features the Tibbits facade. These beautiful glossy mugs have a sturdy handle and are available in storm grey, navy blue, or black. They will be shipped via USPS. 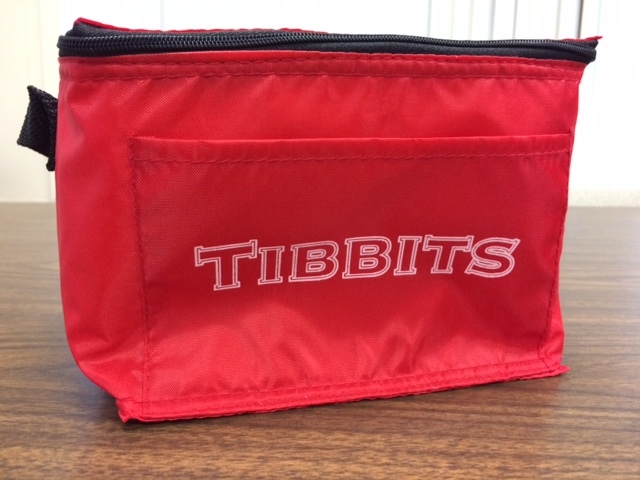 Show your support of Tibbits at the office, at a picnic, or at your next family gathering. This red vinyl lunchbag with the Tibbits emblem will keep your food and drinks cool even on those hot days. 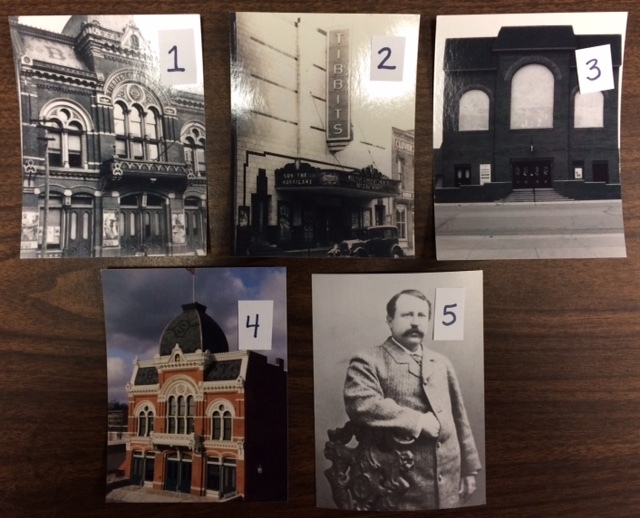 Work your way through the ages with a collection of five Tibbits postcards, each featuring information about Tibbits’ stage in each era on the back. 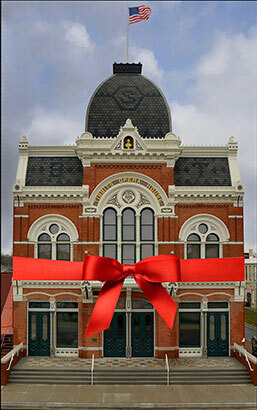 From its glory in 1882 and an image of Barton Tibbits himself, to the movie theatre era, the renovation of the 60s, and the 2013 restoration, you will receive one of each postcard unless you specify otherwise in the order notes section (Please use numbers located on postcards for easy ordering). Know a bookworm? Their collection won’t be complete without this sturdy laminated Tibbits bookmark that features a velvet ribbon. 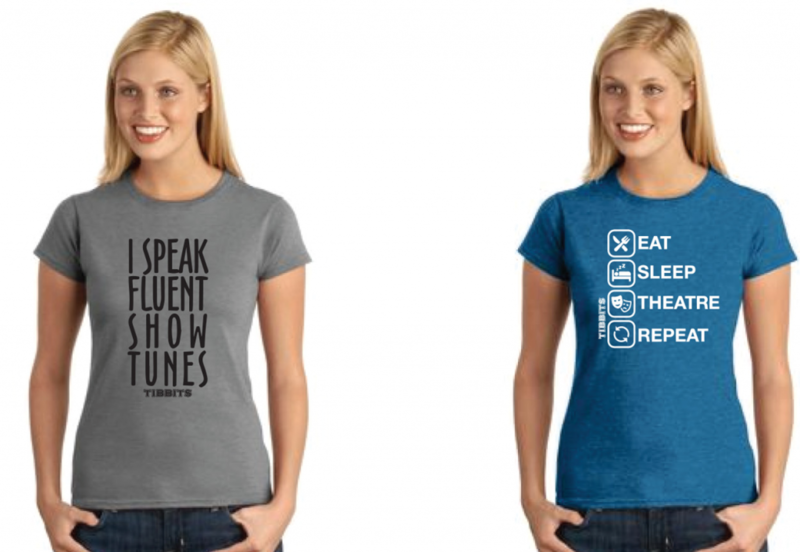 Show your love of Tibbits or theatre in general with these fun t-shirts. Available in sapphire blue and a variety of greys as well as a fitted or traditional style, as shown below. Remember, all of these items (and more!) 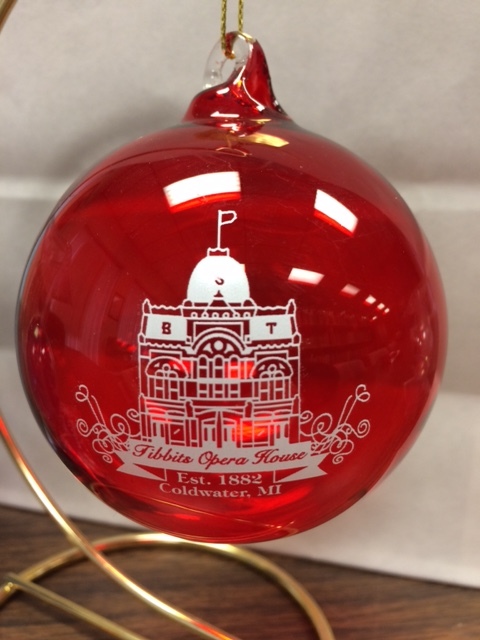 can be purchased at the Tibbits Offices at 93 West Chicago Street, on the corner of Chicago and Clay in Coldwater, Monday through Friday, 9 A.M. to 5 P.M. or in the theatre gift shop during TIBBITS events.